At this time, all respondents identified themselves as creators. avatar animations such as sit, stand, dancing etc. replace Zendesk with a more functional and attractive solution for user forums. bug reports, and blogs. LODs. We need to be able to set our own custom LODs for our meshes. I want to create massive worlds that will blow user’s minds yet I can’t!! Because there’s no way to optimize large distances without LODs. LODs are a basic feature that have existed in game engines for decades, they are not optional. We’re gonna need them in Sansar at some point. Correct smooth working VR, grabbing. moving , throwing. Atlas that identifies how many people are in an experience. The ability to find people in the world, a central hub perhaps. Right now its hard to find where people are at so it feels extremely empty. Create Complex Objects for Sale in the Store (models with scripts and lights embedded. The way we can pay in and to Sansar. Paypal is very important. I would like to be able to buy S$ that way. Also payment in-world. To be able to buy from an inworld store and pay other residents. A sense of progression or a clear goal. I feel that would bring more players into the game, and make them feel invested enough to stay. After receiving 18 responses, and comparing this with recent comments from Linden Lab about the 2018 focus that Sansar will be taking, I think I can make one observation. Creators in Sansar have a wide view of the big picture. They are not narrowly focused on just creating or just selling product in the Sansar Store. This also indicates that the Creators who are part of the Creator’s Open Beta share an understanding with Linden Lab about the many elements that it will take to be ready for a full opening to the public. I will write more as additional responses comes in. I would also be interested in what questions Linden Lab might take the most interest in. Analyzing this data will be subject to my own bias and lack of training in developing surveys, but I will do my best to make these surveys a value to both those who responded and Linden Lab who is creating the Sansar platform. For those of you who have not yet taken the survey, it is still open for additional responses. NOTE: This survey is not affiliated with nor sponsored by Linden Lab. See the survey for more information. This survey has 6 questions and may take you about 5 or 6 minutes. Here is a link to the first survey of Feature Requests for Sansar creators. In this survey I will begin by gathering information about the various categories that should be separate. 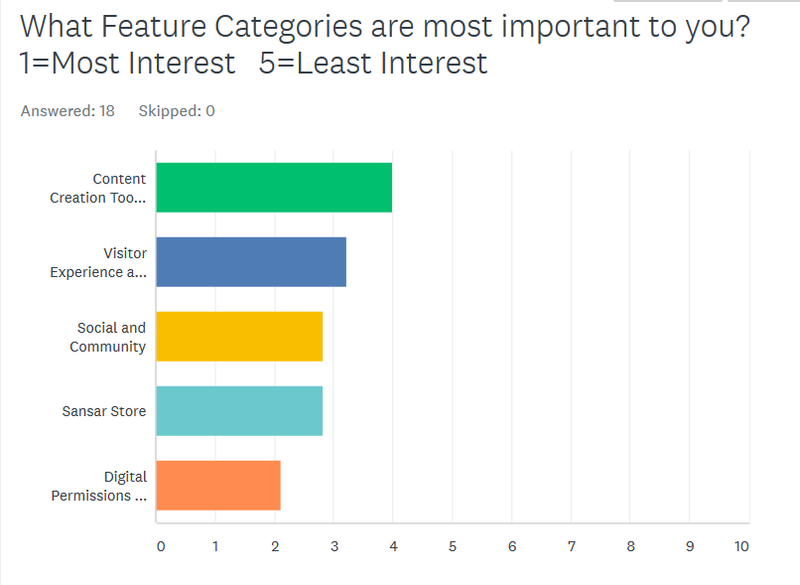 This survey on the topic of Sansar Feature Requests is the individual effort of Ethos Erlanger. Let’s look at the feature requests on the Sansar Forum. Go ahead. Take a look. You will find about 480 requests or “posts”. A few of these posts are duplicates, or they are so similar that they will result in the same feature when Linden Lab implements them. I have been reading them from the first to the last. A few posts we could call void because the functionality is or was already in Sansar. There are not many of those. And only a couple of posts are marked as Completed. The Sansar Team driving the bus has not been using the forum as much as the creators have. When the creators vote either up or down, this give all the readers of the post an idea of the priority that creators place of the subject of the post. If you want to add your own voice to the conversation, you might write a few words in the comments, but that is your choice. At least vote for the ones that are of interest to you. You can ever sort the posts based on the number of votes. Imagine taking a trip on a tour bus and the driver is being bombarded by a bunch of rowdy people on the bus shouting at him to “turn here, go there, hurry up.” They all got on the bus thinking it would take them for a nice ride to Virtual Reality. And the Feature Requests area of the Sansar Forum is like the Public Address system on the bus. The bus driver should use it constantly to keep the passengers informed of what is coming up on the road ahead. By my own count, there are about 480 feature requests as of 9/17/17 and they are generally features that are by and for creators. But if you look at the top four vote-getters that have 10 or more votes, three of them are related to the social aspect of Sansar like: How Many Avatars In An Experience, Party Option To Avoid Instantiation, and Search In The People App. And look at the age of those requests. Three of the four are over Seven months old. A hard case surrounding the kernel of nutritional help inside. The hard shell of the nut. In spite of the tools available to Linden Lab in the Zendesk Forum, the posts and all the interest in them by the creators have no value when the tools are not being used. I filtered by Planned and Not Planned. Nothing is marked either way. Then I filtered for No Status and nearly all of the posts have not been marked with any status. There might not be so much interest in a road map if the Zendesk application was receiving more attention than it is. What is so hard about clicking a couple times to assign a status? Surely someone at linden lab know where we are going. After all, whenever we have meetings in an experience, the often heard request from the Sansar Team is that we should submit a feature request on the Forum. The highest vote-getter of the 480 posts has only 13 votes. This indicates lack of participation from the creators. So, using the Zendesk Forum to its fullest is a shared responsibility. We have to start somewhere to crack through the hard outer shell and get to the nutmeat inside. Voting for the posts that are the most important to us is the fasted way to get a Partial Roadmap using the tools we already have. There are 135 Feature Requests that have no votes at all. So, the original author has not voted for his own feature request. We all have to get behind our own ideas and promote them by voting for them. Have you voted for your requests?